Art Matters week in Santa Fe NM will bring a variety of art related events to many area galleries. Casweck Galleries will present one of the most exciting ART MATTERS evenings on October 19th~ a staged reading of “Motherhood Out Loud” set against the backdrop of a rare preview collection of TV and stage caricature illustrations by the incomparable George Wachsteter. The “Motherhood Out Loud” staged reading will be performed at 6pm in the Gallery by Janet Davidson’s For Giving Productions theater company. The theater group has been critically acclaimed in the recent production of David Lindsay Abaire’s Good People, Nora Ephron’s “Love Loss and What I Wore” and “Imaging Brad”. The company has performed to standing ovations across NM and Colorado Ms. Davidson, director of the theater group, brings with her a wealth of television bona fides, and will set a good foil with the Company reading for the astounding work of George Wachsteter. “Casweck Galleries is becoming known for presenting some of the best pop-up theater and music events in addition to showing the work of some of the hidden gems of American culture and history in art. I am looking forward to it,” says David Forlano, contemporary artists and museum collected jeweler. Casweck Galleries was chosen by the Wachsteter representative to show his collection. This will be a preview of the upcoming 2014 retrospective of Wachsteter’s extensive career. From the dawn of TV, from 1937 to 1967, George Wachsteter (1911 – 2004) was a prominent in-demand American illustrator and caricaturist. Next to Al Hirschfeld, Wachsteter was one of the most visible American theatrical caricaturists at the time. He produced theatrical, radio, television and film related images for the 3 major radio and television networks, NBC, CBS and ABC. Wachsteter’s humorous and elegant line drawings were seen displayed in almost every American living room through the syndicated TV View guide, and prominently placed in most major newspapers, including the Times, Herald Tribune, New York Journal American, and New York World-Telegram. A gradual loss of his vision ended his career prematurely in the late 1960s. The Santa Fe Gallery Association will sponsor over 27 artist and panel discussions as well as lectures hosted in more than 17 different Santa Fe galleries and museums during the first annual Art Matters | Santa Fe to be held on the weekends of October 18-20 and 25-27, 2013. 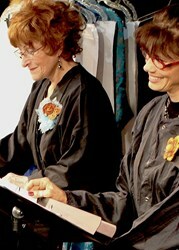 The complete list of participating galleries, events and speakers can be found on http://www.SantaFeGalleryAssociation.org. Casweck Galleries is known for its extraordinary collection by the famed ERNEST CHIRIACKA. Mr. Chiriacka was a famous illustrator during the heyday of illustrators, working for such great publications as SATURDAY EVENING POST, COLLIERS, and ESQUIRE. Mr. Chiriacka illustrated the ESQUIRE PIN UPS for many years and also illustrated over 550 pulp covers. After that period was over, Mr. Chiriacka went on to great acclaim as an oil painter and sculptor, becoming known as the living Remington while he was working. Mr. Chiriacka passed near the age of 97 in 2010 and Casweck Galleries is currently the only place where is his great works are available for sale, although he is currently hanging in many Museums and private collections throughout the US and Europe. Casweck Galleries is located at 203 West Water Street in downtown Santa Fe, NM. 505.988.2966 Space is limited and reservations are suggested.